Samosa Chaat is a delicious Indian street food, spicy, tangy and sweet in the just right proportions to suit your taste buds. 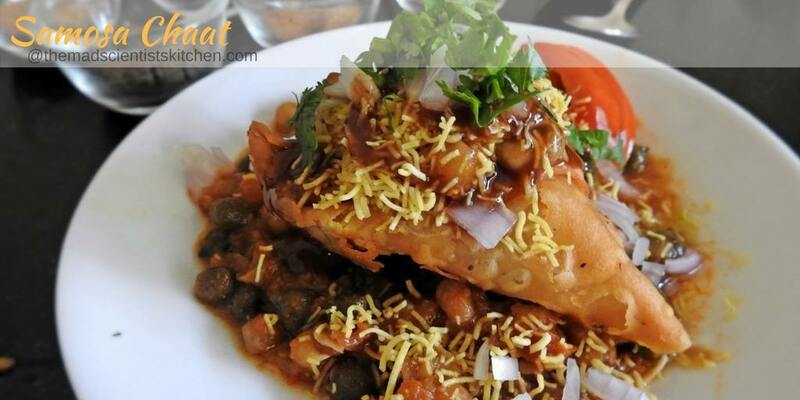 Samosa Chaat is mashed samosa topped with peas or chole masala and topped with tangy chutneys, sev, onion and tomatoes if you wish. I understand that many people do not know the meaning of the word Chaat! To Chaat is to lick and you lick your fingers as you eat a chaat! It is that delicious! 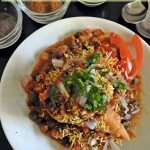 A Chaat (Hindi: चाट‎) for the uninitiated is a savoury snack made from mainly tangy chutneys, crunchy onions and crisp sev among million other ingredients custom made to suit your tastes. Absolutely yummy! As a part of Shhhh Secretly cooking we are this month exploring Haryana. As Shhhh Secretly Cooking we are partnered and with different members and then the partners exchange secret ingredients. You cook with these ingredients from the chosen cuisine. It is fun do join us. I have chosen to make Samosa chaat as my dish, for Haryana but was reluctant to make, as both my daughters are not at home. However, as the post by date for Shhhh Secretly Cooking approached I knew I had to move. Else, I will be disappointing my lovely partner Vidya Narayan who has chosen to give me maida and dahi as my secret ingredients. Vidya has already posted her delicious, healthy version of Dahi Bhalla using dahi and urad dal that I gave her. Do check her place at Masala Chilli a place that is as warm and beautiful as the lady behind it for her food is simple yet yummy and most importantly healthy. The serving I have given here are based on 3 people here who have to watch what they eat. I do not know how I served up but we finished 8 samosas between us in 2 days. Also, I used ready made samosas but you can make them yourself from here. Wash and soak the white peas and cholay separately overnight. In the morning rinse them and then add enough water a pinch of salt and pressure cook for 4 whistles. Let the pressure come down naturally. Set aside. Meanwhile chop the onions, tomatoes, dhania/ coriander leaves. Heat oil in a pan add the garlic paste, ginger paste and sauté for a few seconds till the raw smell goes away. Add tomatoes and cook until the tomatoes are soft. Add the red chilli powder, cholay masala, rock salt, amchur powder, a little salt and some of the water ( I used the water in the cholay) mix well. Cook on a medium flame for 1 minute, while stirring occasionally add water if needed. Add mashed samosas to the gravy and cook for 3 minutes. 2. Make some rough pieces out of the samosa and place it on a plate. Add a portion of the prepared gravy over it. Add dates chutney and tamarind chutney. Add 1 tbsp of onions chopped tomatoes, 1 tbsp curds and 1 tbsp of sev evenly over it. Finally, sprinkle the coriander evenly on it. Add the red chilli powder, cholay masala, rock salt, amchur powder, little salt and some of the water ( I used the water in the cholay) mix well. Now, you can make it in two ways 1. Add mashed samosas to the gravy and cook for 3 minutes. Or 2. Make some rough pieces out of the samosa and place it on a plate. Add a portion of the prepared gravy over it. Oh My God! I am salivating right now! I absolutely love samosa and samosa chaat is my second favorite thing to have at Haldirams! Thanks, Nandita! It is mine too. Samosa chaat sounds so good. My husband favorite snack is Samosa, if I make this he will be double happy ???? True Uma mine was thrilled to bits. Samosa chaat looks lip-smackingly delicious. I am drooling. Loved your presentation. Thanks dear so sweet of you to repeat.Looks like you will be making it really fast. Samosa chaat looks lip-smackingly delicious. I am drooling. Loved your presentation. Superb share. I’m feeling nostalgic at your samosa chat. My brother used to make this for the whole family and we all loved it. ;D Ask him to make it yet again now Ritu. 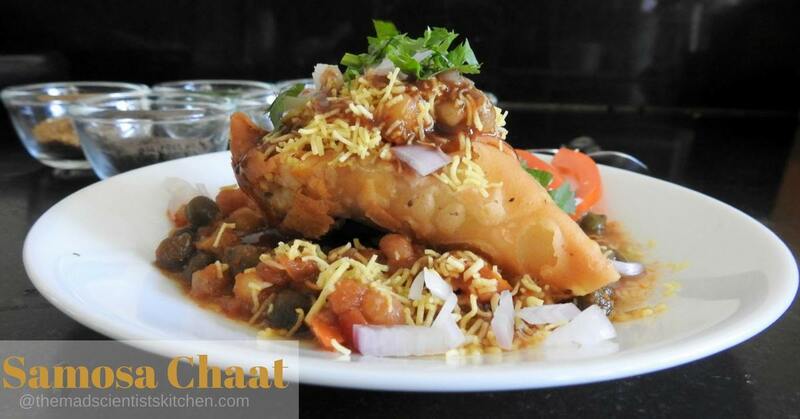 OMG.. mouthwatering samosa chaat. Must make it soon. Feel like eating it right now. 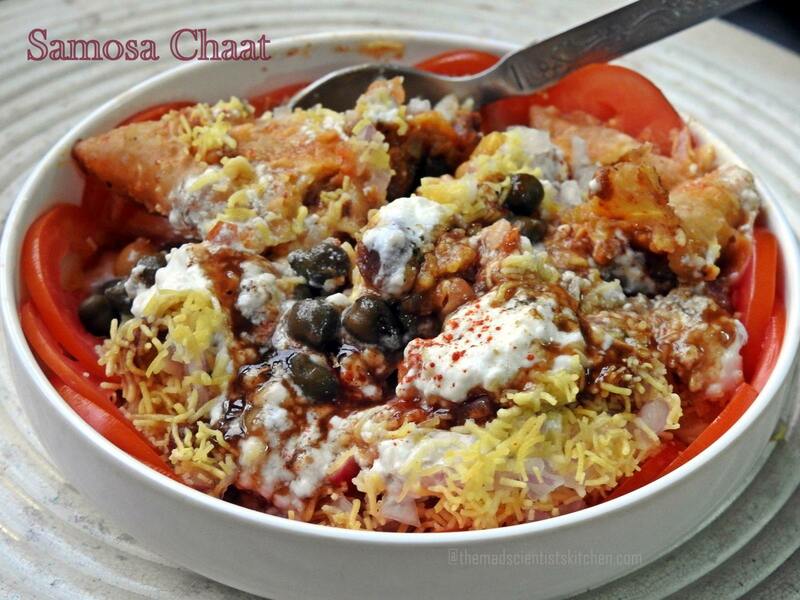 Such a drool worthy post of samosa chaat, loved the detailed recipe. OH. MY. GOD. 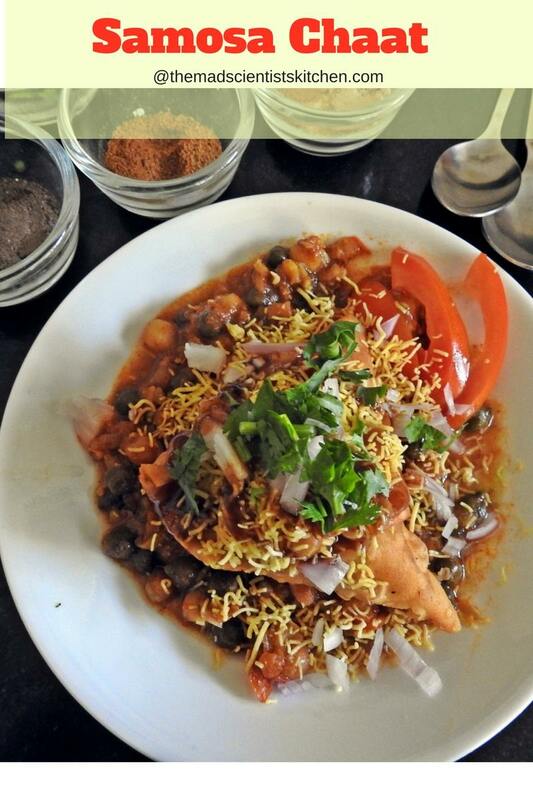 I am dying to have a big platter of this deeelicious samosa chaat. Super YUM! You are welcome to it Jolly. This chaat is just too tempting. Its been ages since I’ve had any chaat. Must admit that I’ve not had samosa chaat but would surely love to try some. Awww! Such a delicious thought” would love to try some” this is what sets us food bloggers apart. Willingness to try something new. Samosa chaat and I am ready to have it here. It looks so inviting, and this is definitely a delicious one. Lovely! Thanks, Jayshree. You comment is making me feel like having some right now. Ohh, those pictures are making me drool. Not in this heat but in upcoming monsoon I could eat whole of that???????? Come over we can enjoy it together Rafeeda. OMG… I’m drooling all over right now. I love samosa chaat. It looks so tempting. Oh my gosh…I’m drooling right now…Now, you have tempted me to make it very soon….Drooling share!! Looks too tempting and mouthwatering, been ages since I had this. I need to make it asap! OMG! You have got quite a teaser here, Archana! ???? If I were granted a last wish, I would ask for this plate of samosa chaat! ???? Aww! Maria so sweet. Thanks, dear. 😀 Well have some for me too but the temperature here is climbing up. Omg, I am drooling Archana , the samosa itself is inviting and when presented as this sinful chaat, it is just amazing. Drooling right now. who can deny this yummy droolicious platter, yum yum !! When I first saw the pics, I had just come out of a long meeting and was travelling back to work. I just wanted to head for the nearest chaat corner for a plate of this delectable dish! Aww! I hope you had some chaat. Thank you for all the kind words my dear and was a pleasure to have been paired with you this month for the challenge. I am a crazy lover of chaats and this has one of my favourite samosas so you can imagine how happy I am to see that you made such good use of the ingredients and turned into something I absolutely adore. If only I could taste some!! Aww Vidya! You come over and we will enjoy all kinds of chaat. Oh wow wow.. I am just drooling here ! Looks amazing ! Samosa chaat looks lip-smackingly delicious. I am drooling. Lovely share. This is such a droolesome post di. 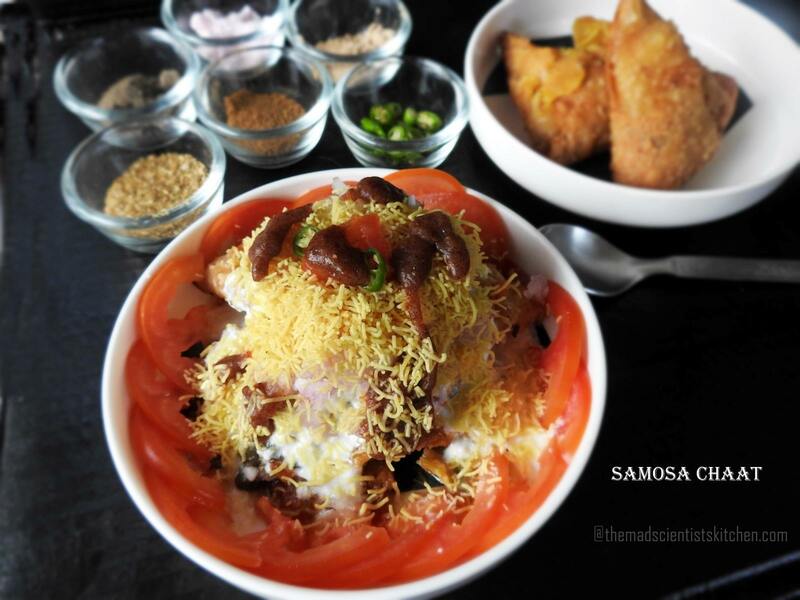 The samosa chaat looks absolutely inviting and delish ! This is such a droolesome post di ! The samosachat looks absolutely delish and inviting ! Thank you! Poonam I can sense your delight here. What a dish…Drooling here….your pictures are just perfect…I want this now…. Im not sure why, I but I have never made chaat at home -not even a simple bhel with ready made items. This lovely post is going to change this status, and the samosa chaat seems the best way to get into making chaat. Thanks for the detailed instructions which will help a beginner chaat maker like me! I am sure you will ace it Sujata. Just follow your tastes. Wahhh what a platter of chaat.. looks delicious and mouthwatering..
Omg, my mouth is just watering here.. This samosa chat rocks Archana, highly irresistible.